Update: The Santa Fe Trail High School volleyball team placed 4th place in the 4A Division II State Volleyball Tournament, Oct. 31, 2015, after taking on Clearwater for the 3rd place spot. In the Division II Pool I games played Friday, SFTHS advanced to the Saturday semi-finals after beating Goodland 25-12, 25-22 in their first pool play match; defeating Anderson County 23-25, 25-23, 25-22, in the second match; and then losing to Clearwater, 21-25, 19-25. In semi-finals, SFTHS took on second seeded Topeka-Hayden, which went on to defeat Concordia for the 4A Division II championship. Clearwater again downed SFTHS to take third place in the state tournament. 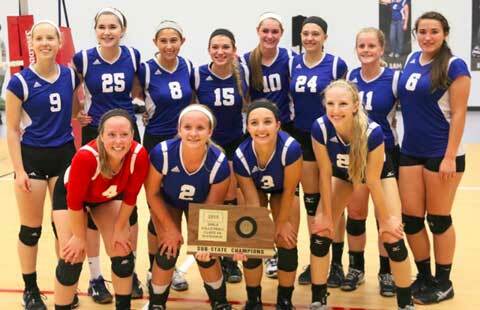 The Santa Fe Trail High School volleyball team beat Baldwin High School for the substate championship. The team will travel to Salina for the KSHSAA Class 4ADII State Volleyball Tournament on Friday, Oct. 30 and Saturday, Oct. 31. Fifth seed SFTHS is scheduled to play at 4:30 p.m. Friday against fourth seed Goodland; at 5:30 p.m against first seed Garnett-Anderson County; and at 7:30 p.m. versus eighth seed Clearwater. SFTHS’s Friday games will be on court A in the Salina Bicentennial Center. Saturday’s bracket will be posted on KSHSAA website at the conclusion of pool play on Friday. Saturday semi-final matches will begin at 2 p.m. Consolation and championship matches will begin 15 minutes after last semi-final match has concluded. Ticket costs are $6 for K-12 students, and $9 for adults. Salina Bicentennial Center is at 800 The Midway, Salina. For more information, see www.usd434.org/vnews/display.v/ART/562f9f33dc8e9. Substate championship photo thanks to www.usd434.org.